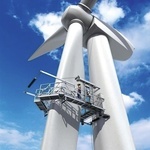 Hailo Wind Systems GmbH & Co. KG offers wind turbine manufacturers a bespoke range of products for equipping towers and servicing wind farms – including ladder systems, fall arrest equipment and service lifts for wind turbines of all sizes. As a technology leader in the field of ladder and access equipment for wind farms, the Haiger-based company has founded a number of branches and production sites in the main international wind markets in recent years, thus creating a comprehensive network for its customers and giving them access to top-quality products, profound expertise and excellent services all over the world. All its products and services correspond to the very highest “Made in Germany” quality standards, thus guaranteeing uncompromising safety and convenient working conditions – wherever the customer happens to be. The specialist provider’s service portfolio is rounded off by an in-house Safety And Rescue Academy, which offers competent training and courses for the safe and easy operation of all products sold by Hailo/Hailo Wind Systems.